Digital Presale Orders To Receive Early Access To Purchase Tickets! 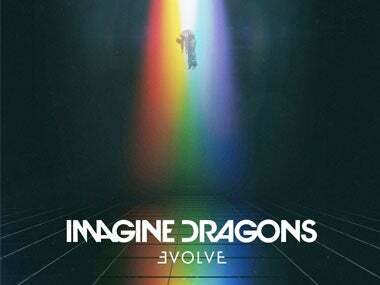 SACRAMENTO, CA – Multi-platinum, Grammy Award-winning band Imagine Dragons will release their third album, Evolve, on June 23rd via KIDinaKORNER / Interscope Records. The band will also bring its electrifying live show to Golden 1 Center in Sacramento on Wednesday, October 4. Citi® is the official credit card of the Evolve Tour. Citi cardmembers will have access to pre-sale tickets beginning Tuesday, May 16th at 10 a.m. local time through Citi's Private Pass® program. For complete pre-sale details visit www.citiprivatepass.com. AT&T customers will also have access to priority pre-sale tickets beginning Tuesday, May 16th at 10 a.m. local time. For complete details visit att.com/frontoftheline. Tickets go on sale to the general public Friday, May 19th at 10 a.m. local time. Golden 1 Center ticket prices are $69.50, $49.50 and $39.50 for reserved seating. For more information visit livenation.com. Evolve is now available for pre-order from all participating digital retailers. Those who pre-order Evolve will receive instant downloads of the first single "Believer," plus new songs "Thunder" and "Whatever It Takes." Listen to "Whatever it Takes" here. Fans who pre-order the album on the official Imagine Dragons store shop.imaginedragonsmusic.com today through Saturday May 13th at 8 a.m. PT will be sent registration instructions and receive priority access in the Ticketmaster Verified Fan pre-sale, which begins on Monday the 15th at 10 a.m. local time. The album can be purchased in a variety of formats and bundles here. Watch the video for "Believer" here and "Thunder" here. "Believer" spent six consecutive weeks at No. 1 at Alternative Radio and broke a 13+ year record for number of spins at the format, besting the record previously held by Linkin Park's "Faint" in 2003. TIME called "Believer" "another showstopper of an anthem," while Entertainment Weekly noted its "thudding tribal drums, a massive shout along chorus, and a wicked bassline that's the sonic equivalent of a slug to the gut." Billboard called "Believer" "a whimsical-yet-authoritative anthem sure to turn even the most hesitant of optimists into a believer." Imagine Dragons will kick off the Evolve Tour on September 26th in Phoenix, AZ, with Grouplove and K.Flay providing support. Verified pre-sale begins Monday, May 15th at 10 a.m. local time to Thursday, May 18th at 10 p.m. local time. Fans can register now for early access to tickets at presale.imaginedragonsmusic.com. By registering, fans will reserve a spot in line for the fan presale, which they can then improve by sharing their unique pre-sale link with friends and family, or by pre-ordering Imagine Dragon's new album Evolve. Fans who have registered will be let into a special ticket presale in waves, based on their place in line. Tune in tonight here at 7 p.m. PT to watch a global webcast of Imagine Dragons performing three songs from Evolve live from the YouTube space in Los Angeles. In addition, Imagine Dragons will perform at the 2017 Billboard Music Awards, which will broadcast live from the T-Mobile Arena in Las Vegas on Sunday, May 21st, at 8 p.m. ET / 5 p.m. PT on ABC. Formed in 2009 and featuring lead vocalist Dan Reynolds, guitarist Wayne Sermon, bassist Ben McKee, and drummer Daniel Platzman, Imagine Dragons earned a grassroots following by independently releasing a series of EPs. After Alex Da Kid signed them to his KIDinaKORNER/Interscope label, the band made its major-label debut with the release of Continued Silence, a 2012 EP featuring the 2x platinum breakthrough single "It's Time." Night Visions arrived later that year and Imagine Dragons found themselves on a skyward trajectory that saw the album debut at No. 2 on the Billboard Top 200 Albums chart and became the No. 1 album on Spotify Worldwide for 2013. Night Visions has sold over 5 million copies worldwide. The album's second single, the 9x-platinum "Radioactive," hit No. 1 on the Billboard Rock chart and earned the band a 2014 Grammy for "Best Rock Performance." The third single, "Demons," hit No. 1 at Alternative and Top 40 radio, and has sold 3.9 million copies in the U.S. Imagine Dragons' platinum-selling second album, Smoke + Mirrors, debuted at #1 on the Billboard Top 200 album chart and has sold 1.1 million copies worldwide. The band's third album, Evolve is due June 23rd. Combining the legacies of three of the most influential record labels in modern music history, Interscope Geffen A&M embarked on a new tradition of musical achievement with its unification on January 1, 1999. Headed by Chairman and CEO John Janick, Interscope Geffen A&M is a major force in global music, developing chart-topping artists across a wide range of musical genres including rock, rap, pop and alternative. Interscope Geffen A&M is part of Universal Music Group, the world's largest music company.